".. the comic timing of all the cast members is superb." ...more than a worthy winner. In February 2011, Meera Syal won the Best Solo Performance for her portrayal of SHIRLEY VALENTINEin theWILLY RUSSELL SEASON. 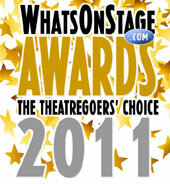 What’s On Stage Awards is the only prize-giving event for the theatre industry voted for purely by the ticket-buying public. Over 45,000 people voted for their favourites in 26 categories. Additional dates have been added to the EDUCATING RITA UK tour. 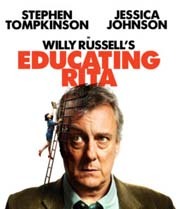 Starring Stephen Tompkinson as Frank, and introducing Jessica Johnson as Rita, the play will open at the Theatre by the Lake in Keswick on 18th April. Directed by Max Roberts, EDUCATING RITA will run through until August. Tour dates and venues are on the WHATSON page. OUR DAY OUT - finally! After over 40 years of waiting OUR DAY OUT will shortly be available on DVD. Commissioned by BBC and directed by Pedr James, the PLAY FOR TODAY was first shown in the late 1970s and continues to be enacted by schools all across the UK. Available on SIMPLY MEDIA, Cat No: 188000, from all good retailers & on-line. Visit HERE to see the trailer. A song from Willy Russell's Blood Brothers has come top in a recent poll. WhatsOnStage asked their readers what their biggest tearjerker moments were from musicals. 'Tell Me It's Not True' from Blood Brothers came top. Could there be any other winner? Visit HERE to see the other nominations. Linzi Hateley has been selected as the new Mrs Johnstone for the upcoming Blood Brothers tour which kicks off in September. Linzi has previously appeared in Carrie The Musical, and was Olivier nominated for her role as the Narrator in Joseph and the Amazing Technicolor Dreamcoat. She also has recorded several solo albums. The tour opens on 4th September in Bromley. Check the What'sOn page for tour dates HERE. Blood Brothers tour dates for the remainder of the year and early 2019 are announced. We have added them to the What'sOn page HERE. The June edition of Artists & Illustrators, features an interview with Willy Russell, in which he talks about his journey to painting and the magazine also showcases some of Willy's art. Artists & Illustrators is out now. The Guardian newspaper writes today that 'Lewis Gilbert, who has died aged 97, may have been best known for his three 007 films, but it’s the films he made about working class life that are his great achievement.' 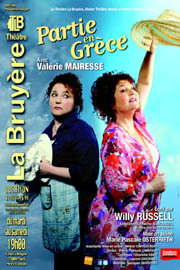 Included in those films are Willy Russell's Educating Rita and Shirley Valentine. Willy pays his respects HERE. Channel 5 will show Funny Women this coming Friday - 9th February, which will highlight Julie Walters, with contributions from Willy Russell. The programme will be shown at 10.35pm. In todays Sunday Mail newspaper, Willy talks about the events which led him to take up painting and return to University. But he says the story he wrote for Rita just couldn’t happen these days. You can read the full article HERE. 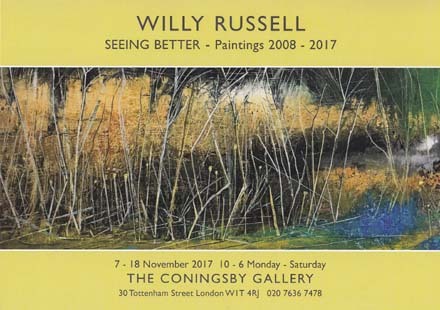 Willy's exhibition of his paintings, SEEING BETTER paintings 2008 - 2017, runs until 18th November at the Coningsby Gallery in London. The London exhibition of 'Seeing Better paintings 2008 - 2017', at the Coningsby Gallery, Tottenham Street, W1T 4RJ opens in a few weeks. The exhibition runs from 7th November - 18th November. You can view the on-line gallery of Willy's artwork HERE. Willy was a guest on Aled Jones BBC Wales programme in November. The show will be repeated this coming Sunday 10th September. Aled Jones programme is on at 13.05 | Sunday 10th September | BBCWales. Norwich, Chesterfield and Newcastle theatres have been added to the SHIRLEY VALENTINE tour starring Jodie Prenger. To check out the UK tour dates visit the 'WHATSON' page. This autumn, for the first time, the work of painter Willy Russell will be shown in a London gallery. 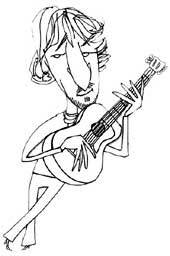 Of course, Willy is mostly known as a playwright, but has never limited himself to this profession, he is also an accomplished musician, songwriter and novelist. The London exhibition, at the Coningsby Gallery, Tottenham Street, W1T 4RJ, runs from 7th November - 18th November. See the 'WHATSON' page for a link to the gallery. “ In a world full of multi-million pound all-singing all-dancing, technically amazing productions we are here at the Assembly Hall Theatre in Tunbridge Wells to see just one actor, with only two different sets, perform a two hour monologue. It all sounds very understated but, when the writer is Willy Russell, the actor is the simply incredible Jodie Prenger and the show is Shirley Valentine, what follows is a theatrical tour de force. “ writes Paul Lucas-Scott after seeing SHIRLEY VALENTINE at Tunbridge Wells Assembly Hall. You can read the full review on the reviews page HERE. Check out the UK tour dates on the 'WHATSON' page. Steve Lee interviews Willy Russell in the latest edition of The Big Issue North. You can read the full article HERE. 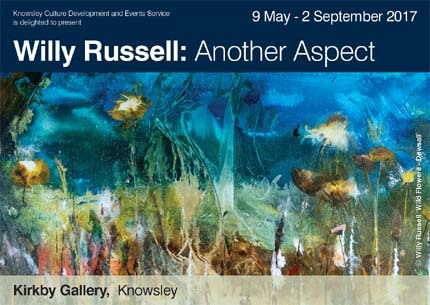 Carol Midgley from The Times visited Kirkby Art Gallery recently to view Willy Russell's art exhibition. She later commented on the visit in the weekend paper and recalled how she, like Willy, was told at school she was an "Art Dunce". You can see the article in the panel on the left and visit the on-line display of Willy's art HERE. “ Jodie Prenger’s engagement with the audience is second to none…” and " Russell’s ability to extract every ounce of humour from the seemingly humdrum lives of ordinary people is remarkable and his observations are both heartwarming and hysterical. 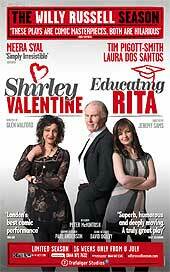 “ says Nicky Sweetland for LondonOnlineNews as SHIRLEY VALENTINEcontinues its tour across UK theatres. Check out the full UK tour dates on the 'WHATSON' page. To coincide with Willy's art exhibition, ANOTHER ASPECT, Landscapes & Figures, running at Kirkby Gallery from next Tuesday (9th May), we have created a Artwork Gallery here on the website. Click HERE to view the Artwork Gallery which will open in a new tab. Willy's art exhibition, ANOTHER ASPECT, Landscapes & Figures, which opens at Kirkby Gallery next Tuesday (9th May) was featured on the BBC local news programme North West Tonight. You can watch the feature, in which Willy is interviewed, HERE. The slot starts about 14 minutes into the programme. We will feature artwork from the exhibition, which runs until September, on the website. Watch this space. As the Belfast Lyric Theatre's re-imagined production begins its tour of Northern and the Republic of Ireland, the Irish Independent newspaper featured a REVIEW of both EDUCATING RITA and a PROFILE on Willy Russell. The production opens in Dublin this coming week (21st - 25th March), and just a couple of weeks later BLOOD BROTHERS opens at the Bord Gáis Energy Theatre ... A feast of Willy Russell's work. In which she tells how ‘I got Willy Russell to play Shirley Valentine after a bottle of wine’... Plus lots more about the current 30th anniversary tour of SHIRLEY VALENTINE starring Jodie Prenger. You can read it HERE. “ Shirley Valentine … is an hour and a half of pure, unadulterated brilliance “ And " In what is an immaculately brilliant script there's always a call for a distinct female lead who can carry it off.... Jodie Prenger steps onto the stage for this run. And what an exquisite piece of casting that is. " says Dan Richards from Black Country Radio. Check out the full UK tour dates on the 'WHATSON' page. 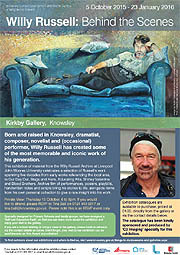 Following his immensely successful exhibition in Kirkby Gallery in 2015, Willy Russell is returning this time to show an entirely new side to his creative portfolio.For this, his first solo exhibition as a visual artist, Knowsley Culture Development and Events Service present a gallery packed with a stunning range of paintings and works on paper inspired by the places and people in his life and whilst the exhibition doesn’t seek to tell a story, it does go some way to tell the artistic journey that Willy is on with his painting. The exhibition opens on 9th May and runs until 2nd September. Further details on the What'sOn page HERE. Shirley Valentine: The Lighthouse Theatre completed its extensive tour of Wales at the beginning of 2017 after a very successful run starring Sonia Beck. The Lighthouse Theatre hopes to be able to present this production in Uruguay, Argentina and Chile during 2017. Educating Rita: Significant productions will be taking place in the UK at Queens Theatre Hornchurch (by the Havering Theatre Trust), Durham Gala Theatre, The Bolton Octagon and Derby Theatres. Blood Brothers: Blood Brothers continues to tour the UK in 2017 with sell out performances and standing ovations at every performance. 2017 marks the 30th year of Bill Kenwright’s touring production. Jodie Prenger stars in the 30th anniversary UK tour of Willy Russell’s SHIRLEY VALENTINE which opens in March. Willy reports a really good read through at opening days rehearsals and Jodie was featured in the Sunday Mail with a great article HERE. SHIRLEY VALENTINE is directed by Glen Walford, who directed the very first production in 1986. The production runs from March through to September. The full tour dates on the 'WHATSON' page. Willy Russell's Pygmalion story still broadens the mind is the Guardian 4 star review headline. " Jessica Baglow is radiant as the gobby but intellectually insatiable hairdresser who spars with her boozy Open University lecturer ". You can read the full review HERE. Educating Rita is currently running at the Octogon Theatre in Bolton. The production with Jessica Baglow and David Birrel runs until 11 February, then transfers to Derby Theatre - 17 February - 11 March. As promised, we have added dates for the new nationwide tour of Willy Russell's comedy SHIRLEY VALENTINE. Glen Walford directs, with Jodie Prenger as Shirley, in this, the 30th anniversary production which opens in Bromley on 2nd March next year. You can find the current tour dates (more to be added soon) on the WHATSON page. Willy will be the guest on Aled Jones BBC Wales programme this Sunday 6th November for conversation and music. Aled Jones programme is on at is at 13.05 | Sunday 6th November | BBCWales. And if you missed it? Catch Up HERE. 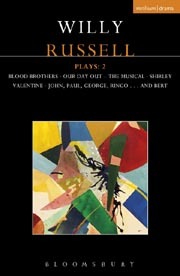 Bloomsbury has announced a new collection of plays from Willy Russell. It features the smash hits Blood Brothers, Our Day Out: The Musical and Shirley Valentine as well as the previously unpublished John, Paul, George, Ringo . . . and Bert. BBC2's ARTSNIGHT programme on Saturday 15th October, will showcase a profile of Willy Russell by Julie Walters. 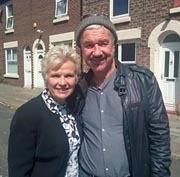 Julie Walters, who played Rita in the original stage play of Educating Rita (1979), and the award winning film released in 1983, travels to Liverpool to interview Willy Russell. WHEN JULIE WALTERS MET WILLY RUSSELL is at 10pm, Saturday 15th October, BBC2. Using music and lyrics to tell the tale. For those who want to experiment with how the story can be told through song and drama. The course will cover setting the scene, assailing the heart, making the point and moving the plot along. Each evening there will a presentation of the day’s completed work. This week is suitable for both tunesmiths and wordsmiths. Willy Russell and Nick Stimpson will tutor this course at Totleigh Barton, in Devon, in November. More details from the ARVON website HERE. 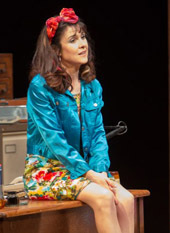 The production of Educating Rita currently running at the Lyric Theatre, (with the action transposed from Liverpool to the Northern Ireland capitol), is impressing the critics and audiences alike. Both The Stage and The Irish Times calls the production ‘…quiet ferocity…’ and give it four stars . Kevin McCluskey for The Public Reviews website gives it five stars . The production directed by Emma Jordan and featuring Rita Kerri Quinn and Michael James Ford as Rita and Frank runs until 5th March. More information on the WHAT'S ON page HERE. This new Behind The Scenes Exhibition of material from the Willy Russell Archive opens today at Kirby Gallery, Liverpool. It celebrates a selection of Willy Russell’s work spanning five decades from early works of the 1970s through to more modern productions of Educating Rita, Shirley Valentine and Blood Brothers. The exhibition presents a rare insight into Willy Russell's work and runs at Kirby Gallery, Knowsley from today until 23rd January 2016. Click the poster image (left) to enlarge. Join award-winning playwright and songwriter Willy Russell for a fascinating evening as he talks to director and Head of Acting at Central School of Speech and Drama Geoffrey Colman. The evening will offer the opportunity to put your questions to Willy Russell and Geoffrey Colman as they roam, delve and explore life, writing and the creative process. This exhibition of material from the Willy Russell Archive at Liverpool John Moores University celebrates a selection of Willy Russell’s work spanning five decades from early works referencing the local area, to Our Day Out, Stags and Hens, Educating Rita, Shirley Valentine and Blood Brothers. Archive film of performances, posters, playbills, handwritten notes and scripts bring his stories to life, alongside items from his own personal collection to give a rare insight into his work. The exhibition runs at Kirby Gallery, Knowsley from 5th October until 23rd January 2016. Click the poster image (left) to enlarge. EDUCATING RITA: The Ensemble Theatre in Australia has just finished its very successful production and is looking to mount a tour in 2017. In the meantime Hit Productions will be undertaking an extensive tour of Australia in 2016. Other international productions include in Argentina, Germany, Israel, Mexico and Poland and the Godot Theatre in Taiwan and The Court Theatre in New Zealand have been licensed for next year. SHIRLEY VALENTINE: Professional Licences have been granted for productions in, The Byre in Scotland, Frinton Festival, Italy, Bulgaria, Croatia, Hungary, Poland, Turkey and Israel. The Czech Republic production is about to reach the landmark of 500 performances and the new production in France, (“Partie en Grece”) is currently playing at the Avignon Festival and will open in Paris in September this year. A production for Russia is in the planning stages with the St. Petersburg SBIC Academic Comedy Theatre. And finally A new production of STAGS AND HENS opens in Romania this year. Writer Paul Farley cooks a pot of Scouse for a party of eminent Liverpudlians to explore the complex flavours and disputed origins of the Scouse accent. In the company of Willy Russell, Gillian Reynolds, Michael Angelis and Roger McGough, Paul explores a rich archive of Scouse voices, charting some of the recent mutations in the accent. Radio 4 | 28th March | 8pm - 9pm. Lenny Henry will star alongside Lashana Lynch in a new production of Educating Rita at Chichester later this year, as part of the venue's newly announced season. The production, which runs in the Minerva Theatre from 18 June to 25 July 2015, will be directed by Michael Buffong. 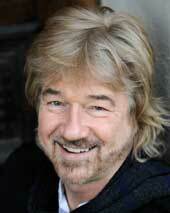 Willy Russell was recently interviewed by Cathy Crabb from Northern Soul webzine. You can read the full interview HERE. Today's Guardian newspaper features interviews with both Willy Russell and Julie Walters, about 'how they made Educating Rita.' During the interview, by Laura Barnett, Julie Walters declares: ‘I was so terrified on opening night, I was taking Valium backstage. I was shocked when people laughed. You can read the full interviews HERE. Straight after terrific reviews for EDUCATING RITA at The Mill in Sonning, comes further reviews praising Willy Russell's 1979 classic play currently at Liverpool’s Playhouse. PublicReviews.com tells us, " Back in Liverpool for its 35th anniversary, Willy Russell’s Educating Rita feels as urgently vibrant as if it had been newly printed. Exploring themes such as class, choice and self-imprisonment, it is a play that speaks to countless generations, and it would be completely unforgivable if you didn’t book seats during the remainder of its run. "EDUCATING RITA runs until 7th March and features Leanne Best as Rita and Con O'Neill as Frank. You can read all the reviews HERE. Three decades ago the Liverpool Playhouse staged the first performance of EDUCATING RITA outside the West End. And now, with three productions currently taking place across the country, EDUCATING RITA, one the best loved two-handers on the UK stage, is once again high on the critics praise list. The production at The Mill in Sonning (running until 26th March) is gathering great reviews . The Stage website says, “…as the storyline resonates with a timeless message about the quest for self-improvement. …Credit lies with Willy Russell and his intelligent script.” You can read the full review HERE. Leanne Best and Con O’Neill, from the Liverpool Playhouse production (opening on 6th February), recently talked to the Echo Arts Editor Catherine Jones, where Con said of Willy “... he’s my Martin Scorsese.” You can read the full Liverpool Echo article HERE. Recently, Willy Russell talked to Carol Midgley, from The Times newspaper, about the new production of EDUCATING RITA which opens at the Liverpool Playhouse on the 6th February. You can read the article in full HERE. Two of Liverpool’s greatest actors join forces in the upcoming production of EDUCATING RITA at Liverpool's Playhouse Theatre. Leanne Best, one of the finest actresses of her generation, returns to the stage where she made her debut to play the indomitable Rita. Con O’Neill, who plays tutor Frank, has a long association with Willy Russell, including his Olivier Award-winning performance in BLOOD BROTHERS and his leading role in the film DANCIN’ THRU THE DARK. The MEN Award-winning actor was once a member of the Everyman Youth Theatre.EDUCATING RITA runs from 6 February to 7 March. More information on the WHAT'S On page HERE. Willy Russell has been asked to design BBC Radio 4 Front Row’s 2014 Neon Artwork in Salford. It will be switched on live on Front Row tonight ( 7.15pm: Monday 15 December ). If you missed Willy talking about the project, you can listen again on BBC iPlayer HERE. BLOOD BROTHERS, one of the longest running musicals in theatre history, will showcase at Hayes Theatre in New South Wales, Australia from February 6 for a strictly limited 4-week season. More information HERE.
' Wonderful, funny and fabulous are just a few of words used to describe Oldham Coliseum's new production of Our Day Out: The Musical ', reads the review from the WHATSONSTAGE website. 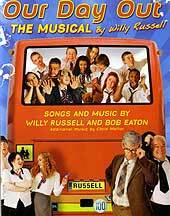 The musical is at Oldham's Coliseum Theatre until Saturday 27th September. More information HERE. 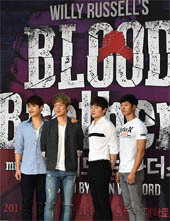 Glen Walford is currently directing a production of BLOOD BROTHERS in South Korea. We have added a slideshow of photographs from the show to the BLOOD BROTHERS - ACROSS THE WORLD page. HERE. As well as OUR DAY OUT - THE MUSICAL opening next week at Oldham's Coliseum Theatre (5th September), and 30 years after it first toured, BLOOD BROTHERS begins another season visiting UK theatres. The award winning musical opens on the 2nd September at Cambridge's Arts Theatre. "Pure Gold..." - UK Theatre Network. SEE THE FULL TOURING SCHEDULE AND BOOKING DETAILS HERE. Our Day Out - The Musical, about which THE STAGE website described " This show is one of those truly magical theatrical experiences that should very definitely not be missed ", will open at Oldham's Coliseum Theatre early next month. The show opens on 5th September and runs through to 27th September. MORE INFORMATION HERE. Glen Walford is directing a new production of BLOOD BROTHERS in South Korea this summer. The production runs through to mid September. We have added several photos of the cast to the BLOOD BROTHERS - across the world page - HERE. Following its two successful seasons in Cape Town and in Johannesburg, Willy Russell’s acclaimed West End musical BLOOD BROTHERS returns to Cape Town from Wednesday, 12 February to Saturday, 29 March. Singing sensation Alistair Izobell, joins the company and will be performing the role of the Narrator. Lynelle Kenned will now be playing the role of Mrs Lyons. The production opens on Wednesday, 12 February at the Fugard Theatre in Cape Town and runs until 29 March. More on What’s On Page. More great reviews are coming in for BLOOD BROTHERS as it visits Fourways in Johannesburg before returning to Cape Town in the New Year. " The best stories can be transferred into any cultural context and still have an effect... can be said of Willy Russell’s BLOOD BROTHERS: the long-running West End musical has been given a fresh coat of South African paint by musical genius David Kramer — and the result is sheer stage dynamite. " " Willy Russell and David Kramer, take a bow — for BLOOD BROTHERS is extraordinary theatre of the highest order. " You can read the full review HERE. To celebrate the deposit of his archive collection in LJMU's Library, Willy Russell presented a one-off event (November 2013) in the John Lennon Art and Design Building in Liverpool. Using his unique vocal range to perform readings from some of his work, he vividly brought to life some of his most famous characters from Shirley Valentine and Blood Brothers. The launch event was accompanied by an exhibition of material from the archive collection, curated and designed by students from the School of Art and Design. You can view a video of the evening HERE. It's become one of the best-loved musicals on the British stage with its emotionally-charged tale of nature verses nurture and its anthemic finale. BLOOD BROTHERS returns to Liverpool this coming week with Maureen Nolan leading the cast in the current UK touring production. To mark the show's return, the Liverpool Echo Arts Editor, Catherine Jones, caught up with some of the cast and crew of the original BLOOD BROTHERS to talk about their memories of the time. You can read the article in full and see some memorable photographs from that early production HERE. Four and five star reviews are coming in for EDUCATING RITA, featuring Gillian Keaney and Philip Bretherton and playing at Salford's Lowry Theatre until 12th October. You can read the full reviews here- What'sOnStage - Manchester Evening News - ThePublicReviews. 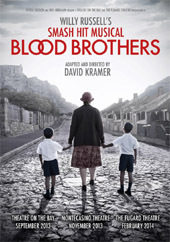 WhatsOnInCapeTown.com is the first to review BLOOD BROTHERS, South African style... "The smash hit musical by Willy Russell, which was the third longest running play on London's West End, has made its triumphant debut in Cape Town. For the first time ever, Willy Russell has allowed an adaptation of the original story, moving it from a setting in Liverpool to one in Cape Town, thanks to some masterful persuasion from renowned South African director David Kramer." You can read the full review HERE. Lesley Stones, from the Cape Town Sunday Independent newspaper, recently interviewed Willy Russell. "A collaboration between world-renowned playwright Willy Russell and South African musician David Kramer is promising a theatrical treat for local audiences." You can read the full article HERE. You may remember we ran a feature on a cast away banjo last year - which Willy once owned... Matt Loxley – the instrument repairer who rescued the instrument from the ignominy of being dumped in a local authority refuse tip has completed the restoration. "With my own banjo playing having become way beyond rusty in the past 30 years, I thought it a good idea to take along banjo player Steve (Rusby), so that we might hear it in its true finery." You can view the photographs of the reunion HERE. Gillian Kearney returns to her Liverpudlian roots to play Rita alongside Philip Bretherton as Frank at The Lowry in Salford later this month. Commissioned originally by the RSC and directed by Mike Ockrent EDUCATING RITA was first performed at the Donmar Warehouse in June 1980. EDUCATING RITA, directed by Chris Honer, opens on the 26th September and runs until 12th October. More information on the 'WHAT'S ON' page. Rehearsals are proceeding well for the first South African production of BLOOD BROTHERS. The company, described by David Kramer (Director) as, ‘young, enthusiastic and talented’, were announced last month and are busy rehearsing new South African influenced arrangements for the songs. The show opens on 10th September at the 'Theatre On The Bay' in Cape Town, before touring. See photograph left. Rehearsals have started for the first South African production of BLOOD BROTHERS. The cast have been announced and includes some of the best known actors in South Africa - Bianca Le Grange (Mrs Johnstone), Elton Landrew (Narrator), Andréa Frankson, Ephraim Gordon and Dean Balie. The show opens on 10th September at the 'Theatre On The Bay'. BLOOD BROTHERS – dates set for groundbreaking South Africa tour! BLOOD BROTHERS, adapted for the South African stage, with Willy's blessing, by singer, songwriter, director and playwright DAVID KRAMER, comes to the South African stage for the very first time. The dates are now set for the Award Winning Musical to open on 10th September at the 'Theatre On The Bay' in Cape Town. The show will run until 19 October before moving on to Johannesburg. More information on the 'WHAT'S ON' page. EDUCATING RITA - "A modern masterpiece"
"There are a handful of tales from the last few decades that belong to British culture so much their very titles are shorthand for the stuff we care about. Shirley Valentine was one, Educating Rita another." So begins the review of EDUCATING RITA at the Garrick Theatre, on the Lichfield Live website. EDUCATING RITA features Tupele Dorgu as Rita and Tom Roberts as Frank and runs at The Garrick until 22 June. You can read the full article HERE. Playwright Willy Russell’s personal archive collection is now available for access at Liverpool John Moores University’s Special Collections and Archives department. The archive collection is a comprehensive representation of Willy Russell’s work to date; it contains material relating to each of his theatrical works, and also to his early work writing for television, his multiple tours and performances as a musician and songwriter, and his novel, published in 2000. The collection contains manuscripts, programmes, publicity material including newspaper cuttings and press releases, correspondence, legal, financial and administrative documents, material relating to the casting and audition process, administrative material, audio and film material, and promotional ephemera. Willy writes "It has always been my intention that if ever my papers and manuscripts were to be deposited, then it would be with a Liverpool institute. I'm delighted to have come to this arrangement with Liverpool John Moores University..."
Willy recently spoke to the Liverpool Echo about the newly announced production of BLOOD BROTHERS which will tour South Africa later in the year. As Willy explained, “The adaptation is by David Kramer and myself and adopts the mix of Afrikaans and English that’s unique to this area as well as bringing some of the particular rhythms and instrumentations of the area to the musical arrangements. You can read the full article HERE. As we announced in Willy's latest Newsletter (HERE), a new production of BLOOD BROTHERS will commence a major tour of South Africa later in the year. The production, adapted for a South African audience by David Kramer, will be produced by Pieter Toerien and Eric Abraham. The show opens in Cape Town's Theatre On The Bay in September. More details on the 'WHAT'S ON' page. The reviews for ONE FOR THE ROAD at Northampton’s Royal & Derngate theatre, are rolling in. The Northampton Chronicle & Echo says, " Funny, moving and thought provoking, you wouldn’t expect any less….." and The Stage.co.uk that "….. the comic timing of all the cast members is superb." Willy Russell's 1976 comedy, which features Con O'Neill as Dennis, runs until 23rd February. More details and ticket information can be found on the 'WHAT'S ON' page. Olivier Award winning actor (and Tony nominated) – Con O’Neill – is to star in Willy Russell’s comedy play ONE FOR THE ROAD, which is coming to Northampton’s Royal & Derngate theatre at the beginning of February. Con plays Dennis, a role previously covered by Alun Armstrong and Drew Schofield, on the eve of his birthday and trying to desperately to ditch his middle class lifestyle. The hugely funny play also stars Matthew Wait (Casualty & Holby), Michelle Butterly (Benidorm)and Nicola Stephenson (Brookside & Homefront) and runs from 1st - 23rd February. More info on What’s On page. Willy Russell will be one of the judges for the very first 'Adrian Henri Poetry in Art' award. The competition, to be held every two years, is open to British artists, makers and poets working in the visual arts including: two-dimensional, three-dimensional work and contemporary craft. Wenlock Poetry Festival Adrian Henri Prize for Poetry in Art will be held from 6th to 20th April 2013 for two weeks at the Twenty Twenty Gallery in Much Wenlock. You can find out more about the competition on the 'Adrian Henri Poetry in Art' website HERE. This weeks 'Bookseller' reports that Blood Brothers tops the best-seller list for a play. "In the bestseller charts, we can see how much students drive the market. Leading the field in the contemporary plays top 10 is Willy Russell's Blood Brothers (Methuen). The play has been running for 22 years in the West End, and the bulk of its BookScan sales come from it being on the GCSE English curriculum." Monday's The Telegraph (15th October) ran a rare interview with Willy Russell. In the interview Willy talks about his early life and his need today to be constantly creative. You can read the full interview HERE. Blood Brothers continues to wow audiences during its on-going tour across the UK. With Marti Pellow and Niki Evans leading the cast, the award winning musical is gathering great reviews. "Blood Brothers is a play everyone should watch - you won’t be able to stop thinking about it once you’ve seen it - and it doesn’t get much better than this production at Milton Keynes Theatre." LUTON TODAY. The latest tour dates are on the WHAT’S ON page. Claire Sweeney, currently playing EDUCATING RITA at Edinburgh's Fringe Festival, was recently featured in the Telegraph when she gave an interview to Bernadette McNulty. You can read her interview in which she tells us 'It was always my dream to play Rita'... HERE. 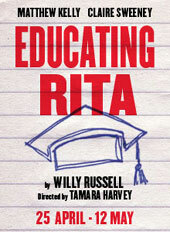 BBC Radio4 Extra will transmit EDUCATING RITA on Sunday 19th August at 1.30pm. The production stars Bill Nighy as Frank and Laura dos Santos as Rita. Willy Russell's musical Blood Brothers, which has been running in London's West End since 1988, is to close in October after 10,000 performances – making it the third longest running West End musical. The show continues to tour and begins its autumn run in September at Southampton’s Mayflower Theatre. See WHAT’S ON page for details. Willy Russell's first novel, THE WRONG BOY has already been published in fifteen languages and from this month ... you can get it in e-book formats also! Matthew Kelly and Claire Sweeney begin their month long residency at the Edinburgh Fringe Festival this evening with Willy's Educating Rita. The play, which has toured the UK, has gathered great reviews during the past few months. 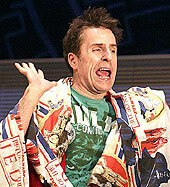 'Claire Sweeney quite literally bursts on stage and into Frank's life as the effervescent Rita. The transformation she undertakes on her journey for knowledge is remarkable.' BACKSTAGEPASS.BIZ and "Kelly is a fantastic character actor who possesses impeccable comic timing. He shines in the role of Frank." MELLOWDAYLONDON.COM. Get your tickets for Educating Rita HERE. 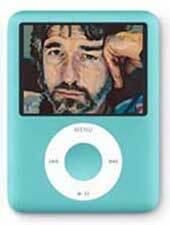 A piece of Willy Russell’s past was recently dredged up by pure chance and coincidence 40 years after he gave it up. Matthew Loxley, wrote to Willy’s guestbook, enquiring if a Banjo he had rescued from the council tip, could have been owned and played by Willy in the 1970s! The clues, Matt explained, were writings on the banjo’s vellum which read; “Whoever may possess this banjo, remember once it was very dear to someone” signed W. M. Russell. And, of course it was once Willy’s and he wrote to Matt, “well, the things that come back to haunt one! I was, in fact, rather moved to see the pics and remember my old tenor which, humble and cheap as it was, gave me years of pleasure.” Matt, who just happens to be a luthier, and had recently restored his father’s Banjo, is now busy restoring one of Willy’s first instruments before it is re-united with him. Stay tuned as this story develops and we’ll show you pictures of the completed instrument in due course. Educating Rita is gathering great reviews during its tour of the UK. "Kelly is a fantastic character actor who possesses impeccable comic timing. He shines in the role of Frank." MELLOWDAYLONDON.COM. “Sweeney is perfect as Rita. She is full of the vitality and brashness that is needed to make Rita both impressive and likable and the audience warm to her instantly.” WHATSONSTAGE.COM. This week the play is at Bath's Theatre Royal before moving on to Aberdeen, Bradford, Richmond, Cambridge, Oxford and Brighton and then a residency at Edinburgh's Fringe Festival during August. Read the reviews HERE. The Dancin' Thru The Dark DVD is now on general release and available from high street shops and on-line. Just a reminder that we have added a special 'Question and Answer' newsletter to the website. Willy talks about the filming, the score and the team behind the film, about which The Daily Mail said, "DANCIN' THRU THE DARK is as vivid and accurate in it's observation of teenagers, as Shirley Valentine was of women." The UK tour dates are now available to view on the WHAT'S ON PAGE, and the stage show runs from 14 May through to the end of July. Matthew Kelly and Claire Sweeney star in Willy Russell’s EDUCATING RITA, directed by Tamara Harvey. Tickets will be going on sale in the next few weeks. Following a hugely successful run in 2010 both at the Menier Chocolate Factory and in London's West End, EDUCATING RITA returns to Southwark Street for three weeks only, prior to a UK tour. Matthew Kelly and Claire Sweeney star in Willy Russell’s modern classic, directed by Tamara Harvey. You can book tickets now direct from the Menier Chocolate Factory website. See link from the WHAT'S ON PAGE. Stay tuned for the tour dates and venues.... coming soon. Yesterday's OBSERVER newpaper ran a wonderful review of BLOOD BROTHERS, written by Susannah Clapp. Running at the West End's Phoenix Theatre since 1991, the show currently stars Marti Pellow as The Narrator, Amy Robbins as Mrs. Johnstone, Stephen Palfreman as Mickey and Simon Willmont as Eddie. You can book tickets on-line at the Bill Kenwright website. Currently running in Tel Aviv is a Hebrew production of BLOOD BROTHERS. The show, which is due to run until 4th March at the Beit Lessin Theatre, is gathering great reviews (READ HERE). BLOOD BROTHERS is directed by Gilad Kimchi and features Ido Rosenberg (Eddie), Nadav Nates (Mickey) and Maya Dagan as Mrs. Johnstone. In 1994 Willy Russell talked to Sue Lawley on Radio 4's Desert Island Discs. The recording is now available on the BBC's website to download. Listen to Willy talking about the route his career has taken - from hairdressing, via teaching in Toxteth to living as one of the country's most successful dramatists. You can hear the recording HERE. Prior to Willy Russell's 'A Celebration of Educating Rita' talk at the RSC's Swan Theatre in Stratford-upon-Avon, Willy sat down to chat with Lorna Jackson, from the Birmingham Post. You can read the subsequent article HERE. Shirley Valentine opens at the Seoul Arts Centre in Korea on 18th November and will run until 4th December. The production will be directed by Glen Walford and stars Son Sook (featured left). MORE HERE. It looks as though there has been a hick-up with the DVD release of Dancin' Thru The Dark. Several of the websites which previously showed the release date as 5th September are now showing a date of 26th March 2012, whilst Play.com is showing both dates!! We'll update the news on the DVD release as soon as things become clearer - stay tuned... In the meantime, read Willy's Q&A newsletter HERE. With the Dancin' Thru The Dark DVD due to be released in a few days, we have now added a special 'Question and Answer' newsletter to the website. Willy talks about the filming, the score and the team behind the film, about which The Evening Standard said, " Sharply-observed, full of humour, it just reeks truth." Dancin' thru the Dark will be available on DVD from 5th September.The film is an adaptation of Willy Russell's play Stags and Hens in which a group of girls and local lads venture out for a night of pre-marriage stag and hen party celebrations. Directed by Mike Ockrent, the film stars Con O'Neill, Claire Hackett, Mark Womack and features a cameo role by Willy himself. This is the 1st time the DVD has been available in the UK. You can pre-order now from you favourite on-line seller! Therewill be aspecial screening of this classic BBC drama at this year's PRESCOT FESTIVAL.Written in long hand in only four or five days, Willy found this reality based drama easy to write. "I still watch it today. The performances are exquisite...it just seemed to be one of those charmed ventures in which everything just fell into place." Catch a rare screening at this year's festival. SEE THE WHAT'S ON PAGE FOR MORE DETAILS. Bill Kenwright Ltdhas announced new dates for the UK tour of BLOOD BROTHERS, which takes the award winning musical through to the end of 2011. SEE THE WHAT'S ON PAGE FOR MORE DETAILS. Willy Russell will be one of Roger McGoughs special guests at his appearance at the MELTDOWN FESTIVALin London this June. Roger, Willy and other special guests will be performing on Friday 10 June at the Purcell Room, Queen Elizabeth Hall. MORE HERE. Willy Russell, is one of the featured writers in this years's on-line LIVEREAD FESTIVAL organised by the Liverpool Daily Post. You can catch Willy's contribution to LIVEREAD FESTIVAL HERE. BLOOD BROTHERS is 1ST CLASS! Royal Mail celebrate seven decades of British Stage Musicals with the latest set of stamps released today. 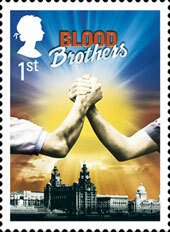 BLOOD BROTHERS is one of the musicals featured (pictured left) and fittingly its a 1st class stamp. See all of the stamps HERE. This evening (Sunday 20th Febuary), Meera Syal was awarded BEST SOLO PERFORMANCE for her portrayal of SHIRLEY VALENTINEin theWILLY RUSSELL SEASONwhich ran to sell out houses, both at the Menier Chocholate Factory and the Trafalger Studios, in London's West End. SHIRLEY VALENTINE,was directed by Glen Walford, who commissioned and directed the original 1986 Liverpool Everyman production. Natasha Hamilton, one third of girl band Atomic Kitten, will make her West End debut this weekend as Mrs Johnstone, whilst Nicky Evans has now swapped places from the West End to the touring production of BLOOD BROTHERS. See UK tour dates and venues on the WHAT'S ON PAGE. In the week before Christmas BBC Radio will broadcast Nine Alternative Lessons And Carols with nine modern stories of Christmas that have been specially commissioned from writers including Willy Russell, Ian McMillan and Simon Armitage. Nine stand-alone stories will be broadcast, one per day, on the Ken Bruce and Jeremy Vine show with an omnibus edition on Christmas Eve (Friday 24th December). Each story is accompanied by a Christmas song and Willy Russell’s story will be paired with ‘Just Like Christmas’ by Low. 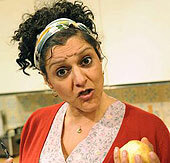 Meera Syal is to play SHIRLEY VALENTINE once again in a BBC production of Willy Russell's award winning play. Radio 4 will broadcast the production on Saturday 18th December at 2.30pm. Meera Syal recently starred as Shirley Valentine in the highly praised Willy Russell Season, initially at London's Menier Chocolate Factory, and the more recent West End production at the Trafalgar Studios. 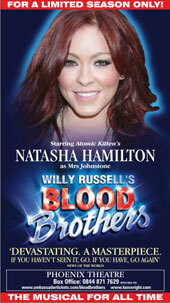 Natasha Hamilton, one third of girl band Atomic Kitten, will make her West End debut next year, joining the cast of Willy Russell’s BLOOD BROTHERS as Mrs Johnstone from January 2011. Natasha will take over the role from Lyn Paul who has regularly played the role on tour and in the West End since 1997. In 1992 Willy Russell was the subject of a SOUTH BANK SHOW special. We've had many requests from visitors who would like to see this show again. Willy kicks off the programme by reciting his famous I HATE THE ARTS poem. We are pleased to say part one is now available to view here. WATCH THE SHOW HERE. The dates and venues for BLOOD BROTHERS tour in 2011 have been released by Bill Kenwright Ltd. The show, now in its 22nd year in the West End, continues to be a huge hit with the theatre going public. Melanie C, who stunned the London critics with her performance, will return to the role of Mrs Johnstone for the shows return to the Liverpool Empire in November (8th - 20th). SEE THE WHAT'S ON PAGE FOR MORE DETAILS. A chance for all you budding playwrights and writers to spend time with, and ask questions of, the legendary playwright Willy Russell. The session will take the form of an onstage interview conducted by critic and journalist Mark Shenton, then Willy will answer questions from the floor. The Masterclass takes place at The Theatre Royal, Haymarket on the 15th October and is FREE to young people aged 17–30. BOOK YOUR TICKETS HERE. Meera Syal (Shirley Valentine) and Laura Dos Santos (Educating Rita) have been nominated in BroadwayWorld UK's first-ever awards. Readers of the website were asked to make nominations in each category to make a shortlist for voting. You can vote on-line on the West End / Broadway World website HERE. "Rarely has a school bus trip been so transporting." Willy Russell's latest musical is playing to sell-out audiences and gathering great reviews during its second season at Liverpool's Royal Court theatre. The Guardian newspaper theatre critic, Alfred Hickling, has given OUR DAY OUT - THE MUSICAL a review in this mornings paper. READ ALL THE REVIEWS IN FULL HERE. With OUR DAY OUT - THE MUSICAL opening next week at Liverpool's Royal Court Theatre, Willy has been talking to Catherine Jones about the new musical and perhaps - future plans.... Read the interview HERE. Willy Russell recently gave an interview to the Daily Telegraph in which he talks about early memories, writing and being nicknamed Woolly Rissole by Paul McCartney. You can read Georgia Dehn's interview with Willy on the Telegraph website HERE. Willy Russell's Educating Rita and Shirley Valentine at the Trafalgar Studios are receiving wonderful reviews in the London and National press. 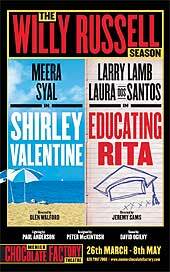 Meera Syal (Shirley Valentine), Tim Piggot-Smith (as Frank) and Laura Dos Santos (Rita) are appearing in Willy Russell's two award winning plays in London's West End. 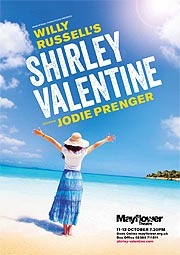 You can read the latest reviews here on the Educating Rita and Shirley Valentine pages. Willy Russell can also be heard on Janice Long's Radio 2 show which begins at midnight on Monday evening. And again, don't forget, if you miss the Monday show, you can catch Janice Longagain on BBC iPlayer. Willy Russell will be one of Clive Anderson's guests on his show this Saturday afternoon - 17 July. The Radio 4 show is a mix of conversation, music and comedy. And don't forget, if you miss the live broadcast, you can catch Loose Ends again on BBC iPlayer. Willy Russell's Educating Rita and Shirley Valentine have had their season extended at the Trafalgar Studios (previously the Whitehall). Tim Pigott-Smith will play Frank opposite Laura Dos Santos in Educating Rita and which will now run from 8 July to 30 October. 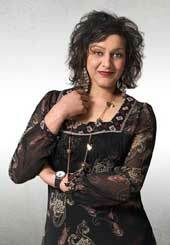 While Meera Syal will reprise her role in Shirley Valentine which runs from 20 July through to 30 October. Melanie C will return to the role of Mrs Johnstone in BLOOD BROTHERS at the Liverpool Empire in November. The former Spice Girl said: "I had such an incredible time playing the role of Mrs Johnstone in the West End. I am so excited to have the opportunity to play her again in my home town at the Empire." BLOOD BROTHERS is on in Liverpool from the 8th through to 20th November. See the WHAT'S ON page for booking details. The Menier Chocolate Factory revivals of Willy Russell's Educating Rita and Shirley Valentine will transfer to Trafalgar Studio Theatre on 26 July 2010, for a limited 16-week run. Tim Pigott-Smith will replace Larry Lamb opposite Laura Dos Santos in Educating Rita, while Meera Syal will reprise her role in Shirley Valentine. The Liverpool Daily Post recently reviewed and discussed THE WRONG BOY as part of it's On-Line Literary Festival. YOU CAN WATCH THE FULL DISCUSSION HERE. The Willy Russell London season at The Menier Chocolate Factory which includes both Educating Rita and Shirley Valentine, is gathering great reviews. This is the first time these award winning plays have been paired together and the season runs until 8th May. YOU CAN READ THE FULL REVIEWS HERE. In the build up to the Willy Russell season at The Menier Chocolate Factory which includes revivals of his award-winning Educating Rita and Shirley Valentine, Willy has given an interview to the Daily Telegraph. YOU CAN READ THE FULL INTERVIEW HERE. The Menier Chocolate Factory will present the first major London revivals of Willy Russell’s award-winning Educating Rita and Shirley Valentine, playing in repertoire from 26 March to 08 May. Jeremy Sams will direct Larry Lamb and Laura Dos Santos (who played Rita in Radio4's Boxing Day broadcast) in Educating Rita, and Glen Walford will direct Meera Syal in Shirley Valentine. More info here on the WHAT'S ON PAGE. Melanie Chisolm has been nominated for Best Actress in a Musical for her take over in Willy Russell's long-running musical BLOOD BROTHERS. The winners of the 2010 Laurence Olivier Awards will be announced at a ceremony at the Grosvenor House Hotel on 21 March. Hot on the heels of the announcement in Willy's latest newsletter that DANCIN' THRU THE DARK will shortly become available on DVD, comes the news that the 1990 film will be shown at FACT on 8 February. FACT is a Liverpool-based cinema, art gallery and the UK's leading organisation for the support & exhibition of film, art and new media. The screening will be followed by a question and answer session with Willy Russell. You can find more information on the WHAT'S ON PAGE. Willy Russell has adapted EDUCATING RITA for BBC Radio4. Due for tranmission on Boxing Day afternoon (2.30pm-4.00pm), this will be the first radio version of any of Willy's stage plays. The production has already been recorded and stars Bill Nighy as Frank and Laura dos Santos as Rita. Click the picture to see photographs of the recording. "Never before have I seen a domino row of hardened critics rise to give a spontaneous standing ovation. Yet this is what they — we — did, along with a rapt and tearful audience, for the gloriously recast Blood Brothers, now celebrating its 21st year in the West End." "Mel C is absolutely sensational!" This is what the critics are saying about Mel C in the role of Mrs Johnstone in Willy's BLOOD BROTHERS. Read the reviews here (The Telegraph), and (The Evening Standard) here. Willy has re-visited EDUCATING RITA in preparation for a BBC recording. The play is scheduled to be transmitted on BBC radio towards the end of the year. The characters of Rita and Frank will be played by Laura Dos Santos (Stags & Hens - The Remix) and Bill Nighy (Love Actually, amongst others!). Former Spice Girls member Melanie Chisholm is to make her theatrical debut in the West End production of Blood Brothers, playing Mrs Johnstone this week. Best known as Mel C, Chisholm will give her first performance on October 26. She follows in the footsteps of Barbara Dickson, Kiki Dee, Carole King, Linda Nolan and Helen Reddy in taking on the role. Blood Brothers, currently playing at the Phoenix Theatre, is celebrating its 21st anniversary in the West End this year. 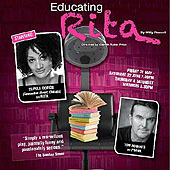 The Watermill Theatre production of Educating Rita starring Timothy Bentinck and Claire Lams is gathering great reviews. "Brilliantly acted and considerately staged" is how THE STAGE describes the play. The play runs until 14 November and you will find more information on the WHAT'S ON PAGE. You can also read the reviews here. Because the dvd/video is not available for this much requested film (and probably never will be! 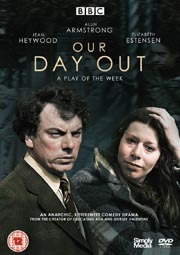 ), WillyRussell.com is pleased to announce that we have now added the television film of OUR DAY OUT onto the site, (You can view the film from the link on the OUR DAY OUT page here). Our Day Out, Willy Russell's latest musical is playing to sell-out audiences and sweeping-up great reviews during its run at Liverpool's Royal Court theatre. WhatsOnStage.com said, "It’s outstanding from the moment it opens right until the final curtain." and The Stage says "Our Day Out – The Musical is one show that surely has “West End Hit” scrawled all over it." Read the reviews in full here. Former Spice Girl Melanie C is to make her theatre debut in the West End production of Blood Brothers playing Mrs Johnstone. Sporty Spice will replace former X Factor contestant Niki Evans and give her first performance on 26 October at London's Phoenix Theatre. The Liverpool Echo has a very timely piece about the BBC tv film of OUR DAY OUT from members of the original cast, both youngsters and adults. Willy Russell based the story on his time working as a teacher at Dingle Vale (now Shorefields comprehensive) school. His inspiration for the television play came in the form of Dorothy King, the head of the school’s special department for children who needed extra help. The paper talks to Mrs King’s daughter Wendy Quinn. “My mother was the inspiration behind the character of Mrs Kay, she always remembered Willy's time at Shorefields, saying he was so creative and inspirational with some of the most difficult children." Read the full article here. 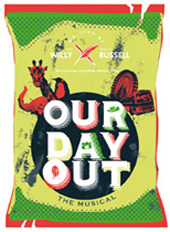 The lyrics to three of the songs from Willy's new musical OUR DAY OUT are now on the LYRICS PAGE here. The three numbers are I'M IN LOVE WITH SIR, NO ONE CAN TAKE THIS TIME AWAY & TO THE ZOO. Rehearsals for OUR DAY OUT continue to roller-coaster along ahead of the eagerly anticipated opening at the Royal Court Theatre this Friday, 11th September. Willy's musical update of this popular television play is sure to be a huge hit. Booking and date details on the 'WHAT'S ON' page. Glen Walford directs a Japanese production of Blood Brothers this month at Tokyo's Creation Theatre. The musical stars Shinji Takeda sharing the role of Mickey with Masaaki Fujioka and Kohki Okada and Mario Tashiro taking the role of Eddie. Ami Suzuki stars as Linda. More information from the 'WHAT'S ON' PAGE. We have added a live recording of Willy Russell reading his poem, 'I Hate Poems'. The poem has been requested many times via Willy's Guestbook and a version was featured in song during The Singing Playwrights tour in 2004. We are pleased to include it on the website. You can hear it here. The new production of SHIRLEY VALENTINE at Liverpool's Royal Court is gathering great reviews with the press saying Pauline Daniels is the 'definitive' Shirley Valentine for lots of theatre goers. Read the reviews here. You can catch this great new production, directed by Glen Walford (who directed the original play when it first opened in 1986) until 9th May. Box Office: 0870 787 1866. Whether you’re aiming to write songs to top the charts, to sing at an open mic night, or to feature in a full scale musical, a new course based at the John Osborne Arvon Centre in Shropshire in August, could help you fulfill your dreams. 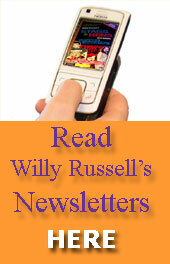 Willy Russell.com has always produced a series of occasional Newsletters in which Willy answers questions raised by visitors to his website. We will be preparing the next newsletter during the coming weeks. So if you have something you would like to ask him, send WillyRussell.com a message via the guestbook contact form and we'll choose a selection of questions to put to him. Willy Russell's award winning film starring Pauline Collins, Bernard Hill and Tom Conti will be featured in the new TV series of MOVIE CONNECTIONS currently showing on BBC1. The programme will feature interviews with key people including Willy and is now scheduled to be broadcast on Wednesday 4th February. The SHIRLEY VALENTINE dates have been confirmed for Liverpool's Royal Court theatre. The new production, starring Pauline Daniels, will run from 23rd April to the 9th May and tickets are now on sale. See 'WHAT'S ON' page for more information. A new Spanish production of EDUCATING RITA will open at the Teatro Trasnocho in Caracas, Venezuela on 23 January. Rita and Frank are played by Catherina Cardozo and Alejo Felipe and the play directed by Moises Guevara. see the link from the 'WHAT'S ON' page for more information. As well as the SHIRLEY VALENTINE Movie Connections programme due to be broadcast on BBC TV in February (see below), a new production of SHIRLEY VALENTINE, starring Pauline Daniels, will open at Liverpool's Royal Court Theatre in 2009. Glen Walford will direct a new production of BLOOD BROTHERS which will open in Tokyo in August and BBC Radio4 is currently casting for EDUCATING RITA. We will have more news and information during the coming weeks. A new production of Willy Russell's OUR DAY OUT - The musical is planned for next year at Liverpool's Royal Court Theatre. Preliminary workshops for the musical are set to take place on 27, 28 and 29 January 2009. Stay tuned for more information. Willy Russell's award winning film starring Pauline Collins, Bernard Hill and Tom Conti will be featured in the new BBC series of MOVIE CONNECTIONS. The programme will feature interviews with key people including Willy and is provisionally scheduled to be broadcast on 11th February 2009. Due to overwhelming ticket demand, Willy Russell's lecture appearance at Liverpool University has been altered. His 'IN HIS OWN WORDS' appearance will now take place on two nights at the Liverpool Philharmonic Hall on Monday 1st December and Tuesday 2nd December. For ticket information please contact 0151 794 2650. BBC television has begun screening it's Liverpool on the Box series, and as well as a new showing of OUR DAY OUT, Willy Russell's work will feature several times, including interviews with him and other Liverpool playwrights. On BBC7, Willy Russell will also feature reading Shirley Valentine. The programme will include an interview with Willy and fellow Liverpool writer Roger McGough. BBC television will show OUR DAY OUT as part of a special screening of Liverpool themed programmes. The film, which was shot in 1976, is still shown and the play performed in almost every school in the country. Play For Today - OUR DAY OUT, will be broadcast on Friday 22nd August at 11pm on BBC4. Willy Russell will be appearing as part of the Barmouth Arts Festival this year at the Dragon Theatre, Barmouth. He will present An Evening With Willy Russell on Thursday 11th September at 7.30pm. Tickets can be booked via the theatre's Box Office on 01341 281697. We hope you like the new website. We've worked on improving the layout and have also added lots of new content not previously seen. Over the coming months we will include film of interviews Willy has given and add snippets of his earlier work... and as well as the regular and very popular newsletters, Willy Russell.com will offer podcasts with unique content. We hope you will enjoy your visit and come back soon. The reviews are flowing in for STAGS & HENS - The Remix, which is running until the beginning of March at the Royal Court Theatre in Liverpool. You can read some of the reviews, including one from THE STAGE on the STAGS & HENS page. The production which runs from 1st February to the 1st March 2008 is directed by Bob Eaton with Eithne Brown as Assistant Director. You can book STAGS & HENS on 0870 787 1866. Willy will be interviewed tonight (Monday 28th Jan) by Mark Lawson on Radio 4s Arts Programme FRONT ROW. The programme begins at 7.15pm and you can 'listen again' for the next week via the BBCs website. 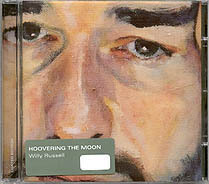 Pure Records is relaunching Willy Russell's CD HOOVERING THE MOON (WR1-PRCD24) and you can now buy on-line from it's website <purerecords.net>. 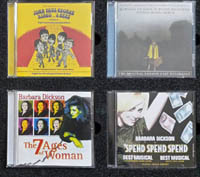 The CD contains 14 original compositions and features Kate Rusby, Barbara Dickson, Iain Mathews, Tim Firth plus Andy Roberts who co-produced the album with Willy. Mike Harding described Willy Russell as "one of the country's great songwriters". The album is also available as an iTunes download from Apple.com ©. Hear a handful of songs on the 'SONGWRITER' PAGE. Philip Key also chatted to Willy Russell prior to STAG & HENS (... a Comedy Classic) opening at Liverpool's Royal Court theatre at the beginning of February. STAGS & HENS runs from 1st February to the 1st March. You can book on 0870 787 1866. Willy took time out from rehearsals for STAGS & HENS to chat to Joe Riley, Liverpool Echo reporter, about Liverpool's 08 Capital of Culture and his hopes for a permanent acting company in Liverpool. As BLOOD BROTHERS kicks off Liverpool's Capital of Culture year, the musical - first performed a quarter of a century ago, is gathering great reviews. The stars, Lyn Paul as Mrs Johnstone, Sean Jones, Mark Hutchinson, Keith Burns and Vivienne Carlyle all receive praise for their performance. STAGS & HENS - 30th EDITION! The dates and cast for next year's production of STAGS & HENS at the Liverpool Royal Court is complete and includes, for the Hens - Rachel Rae (Linda), Gillian Hardie (Bernie) [Gillian has previously played Linda in Blood Brothers], Suzanne Collins (Carol), Laura Dos Santos (Francis) and Keddy Sutton (Maureen). The Stags include Stephen Fletcher (Peter), James Spofforth (Eddie), Kevin Harvey (Robbie) [Kevin can be seen in Dancin' Thru The Dark], Danny O'Brien (Kav), Lenny Wood (Billy) and as the Roadie, Shaun Mason. In the build up to his 'An Evening With Willy Russell at the Lowry, Willy Russell has given an interview to WHAT'S ON STAGE.COM in which he talks about BLOOD BROTHERS… The Movie, Liverpool and the capital of culture celebrations, his love of Slava’s Snow Show and his future plans, including his forthcoming date in Manchester. 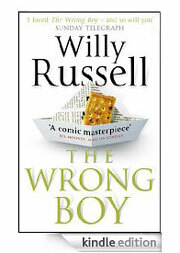 THE WRONG BOY is, once again, being serialised on "OneWord", Channel 4's digital radio. You can hear Willy Russell reading his first novel twice each day on DAB digital radio, and on Sky, Freeview, Virgin Media cable or the internet - www.oneword.co.uk. Willy is delighted to report that auditions for Stage & Hens continue to reveal an astonishing wealth of young acting talent. "From the two auditions we've already held, we could put two quite separate superb casts together - and we've still got more to see." Stags & Hens will open at the Royal Court Theatre in February 2008. Just published by Liverpool University Press is Writing Liverpool: Essays & Interviews edited by Deryn Rees-Jones and Michael Murthy. This collection of essays and interviews addresses the wide range of writing that has emerged from Liverpool and includes an a piece on Willy Russell, interviewed by John Bennett. Writing Liverpool: Essays & Interviews is available from Liverpool University Press; ISBN 9781846310744. The production of Stags & Hens at the Royal Court will rehearse in January and open in February. We don't have the exact dates yet but will post them here as soon as they are confirmed. Bob Eaton will be directing and he and Willy are currently casting for the show. The first auditions took place last week with another round of auditions later this week. Both Willy and Bob Eaton have seen some really exciting young actors which is an excellent start. Contact the Royal Court theatre if you want to audition. Open auditions for the Liverpool's Royal Court Theatre's opening Capital of Culture year show were announced recently. Would-be stage stars can showcase their acting skills in front of Willy Russell. 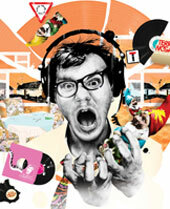 His comedy STAGS & HENS launches the theatre's 2008 programme. Royal Court manager Kevin Fearon said today: "The auditions for Stags and Hens will be for anyone, whatever their experience. Willy wants to see new blood. "Willy will be involved in the auditioning, design and marketing of the play. This season is our gift to Liverpool." 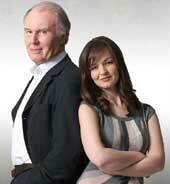 Many of the theatre's regular repertory troupe, such as Andrew Schofield and Eithne Browne, will also be involved. Willy Russell said: "A theatre once on the brink of oblivion is now bursting with vitality. "I'm delighted Stags and Hens will be part of the season."